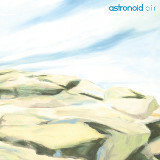 Even for those who would normally appreciate a darker sound, there's no denying that Astronoid's Air is incredibly easy on any ears. Think Alcest meets Devin Townsend, combining the melodic beauty of the first with the quirky harshness of the other. Certain purists have complained about a recent current of emotional, upbeat metal such as Deafheaven, and this will do nothing to make them any happier about kids these days, but Air, which is as fresh and light as its name, ought to show why this type of music hasn't fallen out of favor yet. The album's dreamy sound mixes a ton of genres together; there's shoegaze, prog, and black metal in there, all whipped up into a delicious frothiness. The vocals are high-pitched, clean harmonies, and though I tend to be pretty dismissive of the oohs and ahhs that emo-metal comes up with, this is one album where it would sound out of place not to have it. There are also plenty of blastbeats and tremolo picking present, just without any darkness to their sound -- even black metal mainstays are suffused with sonic light. The impressive riffing on Up and Atom, for example, contains a melodic poppiness of the sort found on a Mastercastle album, but with more of a sense of space; the drum and bass section billows out around a core of fast, tight guitars. The guitar work itself is a blinding flurry of speed, but all the slickness of the rest of the music doesn't stop the band from breaking out into a good old fashioned metal solo once in a while, such as on Obsolete, one of my favorite tracks. Even quiet pieces like Violence have a taut, concealed energy to them, and when the band lets itself out to its utmost, the melodies achieve a soaring elevation. Thin vocals breathe out an emotional melody that avoids saccharin sweetness by weighing it down with smooth guitar/bass riffs, and, on later tracks (the title track and Tin Foil Hats are examples), melodies with more speed and heaviness on the bottom end and a greater complexity. It goes without saying that hipsters are probably going to go bananas over Air, but this really is a great album and fully deserving of any hype it gets. For most metal fans, this is more than worth adding to the collection; post-metal fans in particular shouldn't even think twice before grabbing it.